If you enjoy reading books, love talking to people, and do not mind (or even prefer) a sedentary and routine job, librarian is a perfect choice for you. While this job pays quite low in some European countries, it offers a decent compensation for people it in the US and in Australia (average annual salary for a library clerk exceeds $50,000 in the States). A good librarian needs a variety of skills, and the right attitude to work. Exactly these skills and attitudes will be tested with the questions in an interview. Let’s have a look at them, one by one. 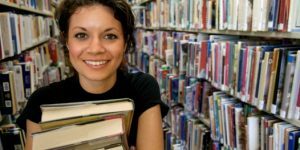 Why do you want to work in a library? This job is very repetitive. What will motivate you to do it well day in day out. How do you imagine a typical day in our library? You should not refer to the past while describing the reasons for your job choice. Saying that you applied for a job becasue you’ve graduated from library science (or similar study program) would indicate a must rather than a desire. Say them that you like books, that you believe to have what it takes to become a good librarian, and look forward to serving the readers and making the library a great place for everyone. If you visit the libraries often, you can even narrate how your positive experience with other library clerks (and the understanding of the importance of their role) motivated you to pursue the same career. One way or another, try to speak with enthusiasm, so the interviews will feel that you really want the job. You have a few options with this question. First one is to say that you prefer routine jobs, that you do not like changes. You can elaborate on it, claiming that you enjoy perfecting your work, and do not get bored in routine environment. Second good option consists in saying that from your point of view, the job is not repetitive. Sure, the tasks repeat day after day, but new readers visit the library each day, there are new books to categorize, and some problems occur every other day. Whether a job is repetitive is always a question of perspective–and you have the right perspective, don’t you? Third option, the most creative one, consists in presenting a proactive approach to work. You can say that you plan to organize (or help to organize) various events for readers (such as reader-writer meetings), seminars, and small concerts in the library, and do other things that will improve the experience of the visitors of the library, and bring some creativity to your routine job. A good answer to this questions depends on the exact job you apply for, and the size of a library. If you apply for a specific position in a big library, e.g. library technician, or administrator, you should refer to specific duties you’ll take care of in the job. In the first case (technician), it will be mostly acquisitions and cataloguing, acquiring, preparing, and classifying materials, so patrons can find them easily. In the second one (administration), you’ll take care of negotiating contracts for services, materials, and equipment, you’ll supervise library employees, perform public relations and fundraising duties. The most traditional job is a library clerk, or, using other terminology, a person who works in user services. This is the guy you know from your library visits–they help you to find information you need, they advise you, they take books you borrowed from the library before, etc. In a small library, the clerk will typically take care of all duties (user, technical, administrative). Anyway, try to speak about your duties with enthusiasm, and show them that you like to be busy in work, and always try to find something to do to improve the experience of the readers. Nowadays, everyone talks about making an impact. People want to do big things with their lives, they want to put a dent in Universe, as Steve Jobs nicely put it. But does a job of a librarian offers room for some unforgettable achievements? Can you change the world, working as the librarian? Well, you can not, at least not when you look at things from a typical perspective of 21st century. But you can definitely have some impact. You can have an impact on every single visitor, on their experience in the library. And this is what you should focus on in your answer. One of the few drawbacks of a job in a library is that it offers very limited options for career growth. The only higher position you can reach is the library director (administrator), or assistant director. And even this journey typically takes ten years or more. Try to ensure the interviewers that they can count with you in a long run. Say that you will be happy to have the same job in five years time, but hope to do it better. Alternatively you can focus on the goals you try to reach in your personal life–starting a family, learning a new skill, quitting smoking, etc. Most people you’ll meet in a library will be nice, and friendly. They will be quiet, they will obey the rules, and it will be a pleasure to work with them. But there will be some black sheep, just like in any other job where one deals with people. Are you ready to deal with them? 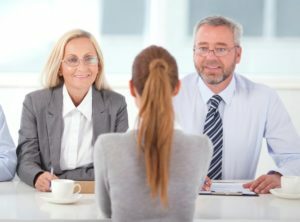 The key is to show the interviewers that you will do your best to ensure the patrons respect the rules, and, at the same time, you’ll do your best to satisfy the needs of each individual customer. For example you can say that you will explain the rules in a calm and cheerful way, trying to motivate the offender to change their behavior. If it does not work, however, you’ll not hesitate to take them out of the library. Or you will call a security guard if they are aggressive. Why do you want to work at this library, and not at another one? What is the last book you read. Will you recommend this book to the readers? Try to describe it in less than twenty words. Why did you leave your last job/Why do you plan to leave your present job? What are your expectation on the administrators of this library? How would you describe an ideal boss? Describe a conflict you had with one of your colleagues (classmates). How did you handle the situation? Describe a time when you went above and beyond for the customer. 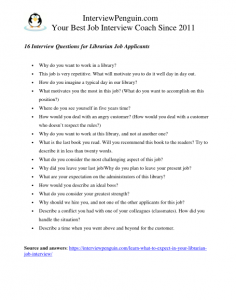 Generally speaking, job interview for a library clerk position belongs to easier interviews. You won’t compete with many other applicants, and you won’t deal with difficult technical questions, or personality tests (exception just proves the rule in this case). Nevertheless, you will have to demonstrate right attitude to work and to the world of books, and you will have to convince the interviewers of your motivation, and honest desire to do a great job as a librarian. Interview Success Package – Brilliant answers to thirty most common interview questions, and a guide on how to impress your interviewers. Interview attire tips – Some ideas for the brave, and for people who like to experiment with their clothes.